The Raven 12 Thickness + Coating Sensor by LiteSentry is a patented, non-contact, in-line sensor that measures moving or stationary glass to +/-0.1 mm. The Raven mounts above the glass line in a rugged aluminum and steel housing designed for industrial environments. The Raven provides 100% inspection and automated data collection, replacing periodic human inspection. 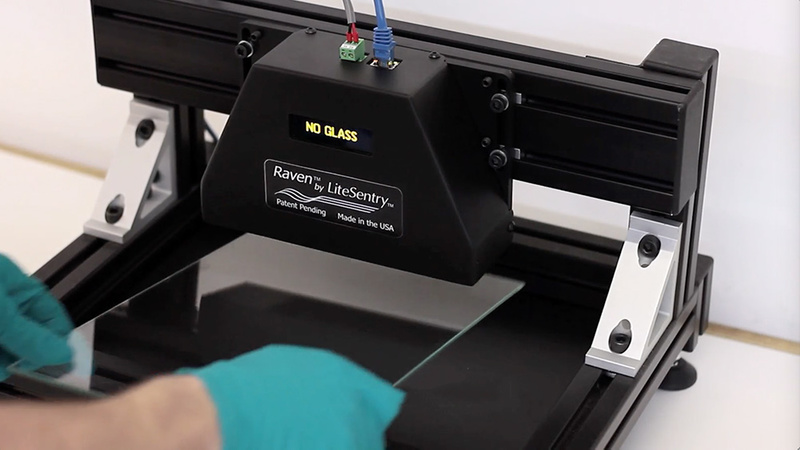 The Raven sensor monitors glass thickness, coating, and coated side to confirm thickness and coating orientation. Eliminates costly errors. The optional Integrated Controller (IC) provides an alarm when detecting glass presented in the improper orientation. The Raven IC will detect glass thickness and coating, sounding alarms when out of conformance with user-defined criteria. The Integrated Controller includes a processor, user-defined alarms, LCD screen, 24 VDC power supply, power distribution, and audible and visual alarms. With the Raven, nothing goes unnoticed!